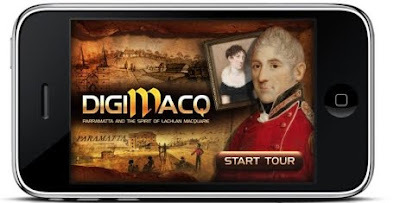 Want to experience Parramatta as it was in Governor Macquarie's time? View the district through the eyes and voices of the soldiers, settlers, rogues and clergy who roamed the streets of the city in colonial times with a terrific iPhone App by Parramatta City Council. This fun and interactive tour takes you on a journey with a lively account of Macquarie's vision for the remote penal colony. This free app is brilliantly produced, with terrific voiceovers (I loved the accents of the narrators) and lovely images. Don't have an iPhone? Until 28 July you can hire an iTouch for free from Riverside Theatres. For more information, contact Discover Parramatta.